"Assembly is just as easy when it’s time to add flavor to your next meal." "When you’re ready to take your marinated meats to the next level injecting marinades ... a gun is the next step." "Great for kitchens with limited storage space, this dual-use baster and injector lets you marinate meat ... and use it as a standard baster." "This is ergonomically designed for easy one-hand use." 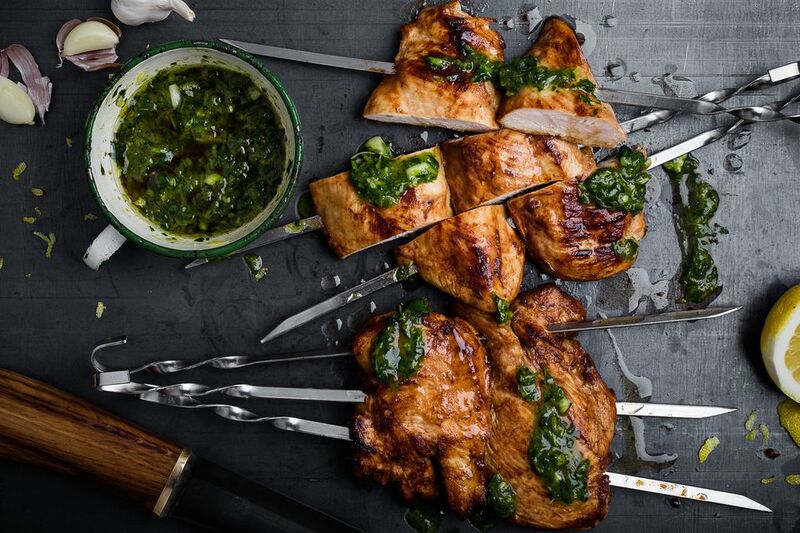 "When it’s important to inject precise amounts of marinade, this injector makes it easy." "This pump-injector can send a nearly endless amount of marinade into your meat." "If you want to quickly marinate foods, but don’t like the idea of poking the food with needles, this marinating container does the trick." This injector is made from 304 stainless steel that won’t stain, rust, or retain flavors. It includes three marinating needles, designed for different purposes. One of the 6-inch needles has a solid tip and 12 holes along the length of the needle, while the other 6-inch needle has a wider tip that lets you use slightly chunkier marinades. The third tip is just three inches long, for precision injection and for use in thinner meats. This holds 2 ounces of marinade, so you won’t need to refill as often, and the injector plunger offers improved pressure control, so you’ll inject the flavors exactly as you want to. The three ring handle provides a comfortable grip and easy injecting. This comes apart easily for cleaning and is dishwasher safe. Assembly is just as easy when it’s time to add flavor to your next meal. When you’re ready to take your marinated meats to the next level injecting marinades, just like cooks who participate in barbecue competitions, a gun is the next step. This gun lets you inject a precise amount from 1 to 5ml in each dose. It holds up to 50ml, so you won’t have to refill often. This kit includes the gun, four marinating needles, three cleaning brushes, and a case to transport and store all the pieces. Unlike inexpensive injectors that are disposable when parts get lost, you can buy spare parts for this gun. The gun’s needles can penetrate up to 5 1/2 inches deep into the meat, and it’s easy to set the injection amount with a simple dial. The needles include one with a slanted tip for precision injecting thin, smooth marinades; one with a closed tip and side perforations for dispersing thin liquids; an oversized needle for thicker, chunkier marinades; and a small, thin needle that leaves fewer visual marks on the surface of the meat. The squeeze handle is easy to operate, much like a caulk gun, and the medical grade materials and the extra strong needles are made to last. Great for kitchens with limited storage space, this dual-use baster and injector lets you marinate meat when the needle is attached, then you can use it as a standard baster with the needle removed. This holds 1 1/2 ounces and refills easily by squeezing and releasing the bulb. If you know how to use a standard baster, you’ll have no problem using this to marinate. While this isn’t as efficient as stand-along injectors, it works well for occasional use. The needle can be stored inside the baster when not in use. A cleaning brush is included. Not everyone needs a fancy, expensive injector that will last a lifetime. This budget injector is inexpensive enough that you won’t be upset if it disappears into the black hole that exists junk drawer, but it’s still well built. It even includes two spare o-rings for easy replacement if one disappears during cleaning. The needle and plunger rod are made from food-safe 304 stainless steel, while the rest is made from eco-friendly plastic with silicone seals. This is ergonomically designed for easy one-hand use. It holds one ounce and has measurement markings in ml and ounces so you can easily see how much is in the syringe and how much you’re injecting. The needle is 3 inches long. For easy cleaning, this is dishwasher safe, and a cleaning brush is included if hand washing is preferred. This holds 1 1/2 ounces, and two different needles are included. The small needle is designed for thin, smooth marinades, while the larger needle can handle chunkier liquids. For easy cleaning, all parts are dishwasher safe. A storage case is included, to keep all parts safely together. Built for serious barbecue and smoking enthusiasts, this pump-injector can send a nearly endless amount of marinade into your meat. Just place the end of the suction tube into a container of marinade and pump the handle to start the liquid flowing. A filter can on the end of the suction tube ensures that chunky herbs and spices will be left behind while the flavorful liquid is injected into the meat. Made from heavy-duty polymers with a German steel needle, this is designed for years of use, and when parts begin to wear, replacements are available. If you want to quickly marinate foods, but don’t like the idea of poking the food with needles, this marinating container does the trick. You’ll need a FoodSaver vacuum machine to use it, but if you already own one, this marinator is a very useful accessory. Just place the meat in the container along with the marinade, place the lid on, and use the FoodSaver to vacuum seal the container and marinate the meat in minutes instead of hours. The vacuum process opens the pores of the meat, allowing the marinade to penetrate quickly and deeply. Besides marinating meat, fish, and poultry in about 12 minutes, this can be used for quick-pickling vegetables as well. The container is BPA-free plastic that is odor proof, stain proof, dishwasher safe and microwave safe. When it’s not being used for marinating foods, this can also be used for food storage.